Every cricket fan in India is eagerly waiting for the inauguration ceremony, and first match of the Indian premier league IPL 3 set to start tomorrow evening. The official broadcaster of IPL 2010 in India is Sony SetMax. Other than them, Google YouTube also provide online streaming of all IPL 3 T20 matches, in association with BCCI. Those who cannot watch IPL in any of these methods can get the live action on their mobile devices. Here in this post we will tell you how you can get live streaming on IPL in your mobile phone or to get score updates and videos. Get IPL 3 live streaming in mobile. We earlier reviewed mimobi.tv, an application that can be used stream Indian TV channels on mobile. Apalya, the creators of this mobile TV applications has agreements with several Indian mobile networks and companies. Apalya technology is being used in Tata photon TV and BSNL 3G mobile TV service. They have partnered with IPL to provide live mobile streaming of T20 cricket matches. Users will need to purchase special packages to watch live IPL streams. There is Symbian, Blackberry and Windows mobile applications for accessing Apalya services. BSNL 3G users send SMS MY3GTV to 55447 for live mobile TV activation. ESPN cricinfo website provide up to date information on anything cricket. They have a mobile application called Cricinfo mobicast that is available for download here. If there is no rights issues with BCCI, we expect IPL 3 live scores to be available in this application. Search with term “IPL” to download applications for related with IPL 2010 matches. IPL has partnership with Sigma Ventures / Dot Com Infoway and July Systems for developing mobile applications in different platforms. 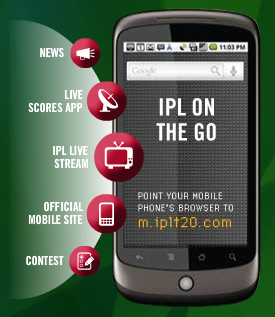 They provide live mobile video clips and score updates of all IPL matches. Mobile carriers will also offer WAP, SMS, MMS and IVR based IPL updates accessible from phone SIM menu. Finally the IPL 3’s official mobile website at m.iplt20.com has everything from SMS alerts, live streaming, games, smartphone applications, real-time photo galley to news updates of the latest IPL action. FOR VISIT LIVE IPL VISIT MY WAPSITE.